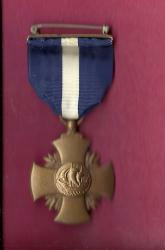 Genuine Vintage WWII Navy Cross full size medal. Displays well with a nice clean straight ribbon drape. Navy Cross is in nice used condition with natural aging to the bronze. Scans of the front and back are provided so you can make your own determination. Medal has the full wrap pin assembly in undamaged condition. Guaranteed Genuine. Made by the US Mint. These continue to get harder to find.